Headed To Mars? Watch Out For Cosmic Rays : Shots - Health News The dose of radiation an astronaut would experience on a trip to Mars is higher than the annual limit set for workers at nuclear power plants. But Mars enthusiasts say the radiation threat isn't high enough to cancel the trip. 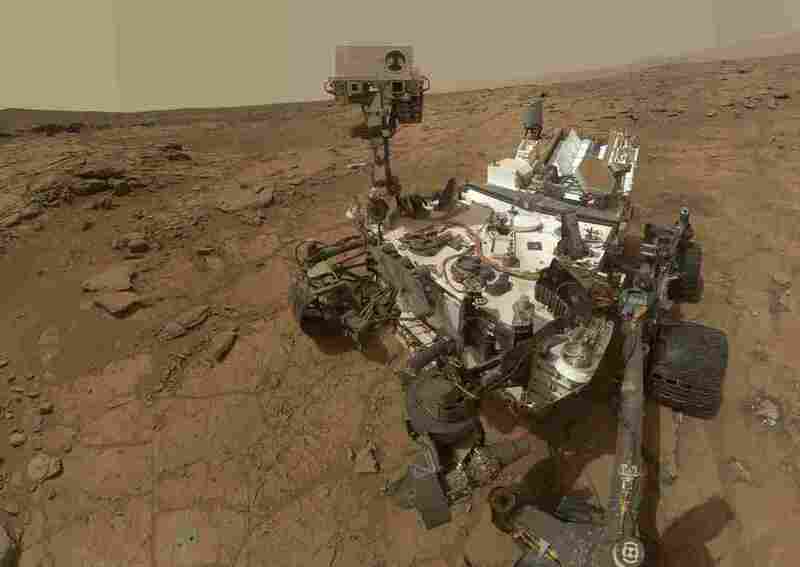 NASA's Mars rover Curiosity used its Radiation Assessment Detector (RAD) to measure radiation exposure on the way to Mars. Now, it's recording similar data on Mars' surface. This image is a composite self portrait taken on Feb. 3, 2013. There was great fanfare when the Mars Science Laboratory launched in November 2011, and again when its precious cargo — NASA's Mars rover Curiosity — touched down on the red planet in August 2012. The eight months in between had drama of their own. Curiosity was constantly bombarded with radiation as it traveled through space — high-energy protons thrown out by the sun, and galactic cosmic rays slicing through the solar system from distant supernovas. Here on Earth, the magnetic field and atmosphere shield us from most of this radiation. But out in the void of space, high energy particles would rip into an astronaut's DNA, slowly increasing the risk of cancer. That's a problem for NASA and the handful of private companies that have pledged to send human explorers to Mars. For a long time, they've been trying to figure out just how much radiation an astronaut would experience on the journey. Enter Curiosity, which was handily equipped with RAD — a Radiation Assessment Detector. The monitoring device was intended to gather radiation data on the surface of Mars. "But about two years before launch we started to realize the fact that RAD was tucked inside the belly of the spacecraft sort of in the same location that a future astronaut might be on a future mission," says Don Hassler, the physicist who led the Southwest Research Institute team that designed RAD. The researchers reasoned they might as well turn the device on during space flight. A few days after launch, RAD powered up and started collecting data. A small portion of the radiation — about 5 percent — came from brief but intense solar storms. Astronauts would be able to avoid this source of radiation by retreating to a sheltered area of their ship. Just ducking down inside a room lined with food supplies would do the trick. Fluctuating solar activity controls radiation in the solar system. The sun produces solar flares, like the one captured in this NASA video, flinging high energy protons and radiation out into the solar system. High solar activity suppresses galactic cosmic rays — high energy ions cast off by distant supernovas. When solar flares die down, cosmic rays are more prevalent. The solar cycle, from maximum to minimum activity and back again, is approximately 11 years long. Right now, we're approaching a solar maximum. The bulk of the radiation was caused by galactic cosmic rays — beams of high energy ions that we don't know how to shield against. Hassler says there's really only one way to minimize the damage caused by these rays: "Go quickly." The shortest possible trip to Mars with current technology would take about six months. During that time an astronaut would experience about four times more radiation than someone on the International Space Station. "An astronaut on ISS for, say six months would receive on the order of maybe 80 millisieverts, compared with the 330 we receive on our way to Mars," Hassler says. The average American is only exposed to about 6 millisieverts of radiation per year. An abdominal CT scan subjects a patient to 10 millisieverts. The dose from a long journey through open space is much higher. Calculating cancer risk from radiation exposure is tricky, but basic estimates suggest a trip to Mars would increase your risk of getting cancer by about 1.5 percent. Double that number for round trip visit, and you quickly approach the limits recommended by the National Council on Radiation Protection. But that doesn't discourage Robert Zubrin, president of The Mars Society and author of The Case for Mars. "Radiation is not a showstopper," he says. "It's not something that the FDA would recommend that everyone do. But we're talking about a mission to Mars here." Zubrin says there are plenty of other risks involved in a Mars mission — and they're risks many would be willing to take. He notes that about 1.5 percent of space shuttle flights ended in disaster. "And yet there are millions of people that, if they had been offered a chance to fly on the shuttle and knowing that, would have jumped at the chance," Zubrin says. The average person already has about a 20 percent chance of dying from cancer. A 40-year-old astronaut who dreams of setting foot on the red planet, might not be bothered by bumping that risk up a few percentage points. "What this paper does is place foursquare in front of the NASA leadership [that] there's no cause for delay, at least as far as radiation is concerned," Zubrin says. "We should now set our course for Mars." 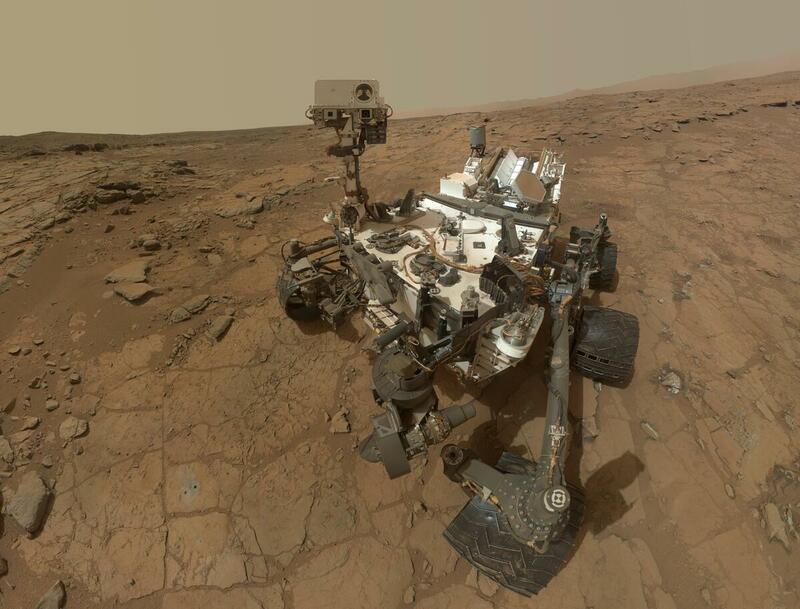 Scientists still have questions about radiation on Mars itself. They need more data to better understand the cancer risk for Mars settlers on the surface. But don't worry. Curiosity is working on that too.